Whilst one of the bigger bookmakers in the industry at the minute, it’s probably fair to say that 888Sport don’t get the recognition that some of their competitors get. The brand has seen many revamps and going from the early days of predominantly being an online poker and casino portal, to now working extremely hard within sports betting, hasn’t been a straight forward transition. But, their player base is one that’s steadily been growing throughout the years. They’ve clearly been working on hard on player acquisition as well, improving the design of the sportsbook and also how it operates. Football has been at the forefront of this expansion and we are going to be looking to see if they are able to hang tough as one of best betting sites for betting on football in the UK. One of the most important factor when betting on football is the price that you take for your bet. There are dozens of bookies these days, which is great for the punter, but it also forces the bookmaker into making sure their odds are right up there with the best. 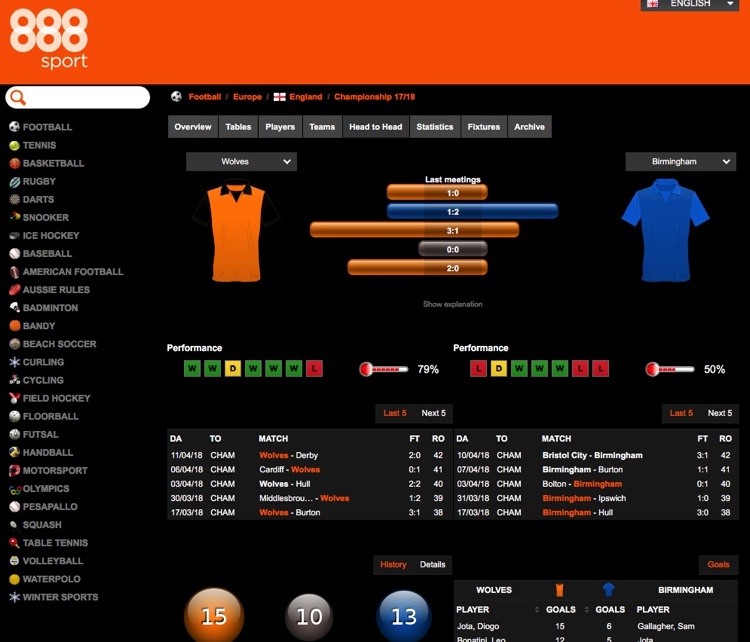 888Sport fit the bill well in terms of the overall odds that are on offer. We found that they were pretty competitive, if a little erratic. But, being erratic isn’t necessarily a bad thing. In fact, we see this as a positive. You see, you aren’t ever going to be able to get the best odds for every single bet that you place. Well, you can, but you’re going to need dozens of active betting accounts, which for most of us is going to be a nightmare to manage. The trick is, to get a pool of bookies that are going to be able to spring that huge betting price. 888Sport are one of those bookies. You might see them at one of the worst prices for some games and then the best price for other games. For example, here we have them at a joint industry best price of 2.35 Leicester to win against Southampton and one of the worst industry prices for a Southampton win of 3.00. Another example is the game between Arsenal and West Ham, where the price of 1.40 for Arsenal to win is one of the worst prices in the industry, yet their price of 7.50 is the joint best price you can take. What you will find is a massive difference between the number of markets for the Premier League compared to lower league. For example, on the same day of the Newcastle game as mentioned above, Wolves take on Birmingham in the Championship with just 93 markets to choose from. Much lower, but if you compare that to some of the offerings from big names within the betting industry for Premier League matches above, then it’s actually still offering a really good market depth. Whilst not necessarily a unique market, we did want to highlight that 888Sport have fairly recently added in Asian Handicap betting. We know that this is proving to be one of the more popular betting markets, especially for those looking to bet on the Premier League, so it’s been a welcomed addition. Overall, we loved the range of markets that were involved on the site. They offered a great mix of everything that you could want to bet on, with everything from corners, cards, Asian lines, handicap bets, player specials, scorecast and wincast. Outside of the UK the site does a really good job of covering all sorts of international football markets. The likes of Serie A, Bundesliga, La Liga and so on, make up a good percentage of this, but the games come from all around the world, including Jordan, Jamaica, Kenya and even Luxembourg, to name just a small sample of what’s on offer. Obviously, as you get to the more obscure leagues and matches, the range of markets that are on offer will dwindle slightly. The couple of games that Kenya that were currently on site offer around 15 markets, but to be fair, this is still an impressive number and higher than we thought when we saw where the games were from. The popular leagues, mainly from within Europe have a bigger selection of games. They don’t quite reach the peak of the Premier League, but they do offer more coverage than Championship games and lower league matches. The screenshot above is from a list of upcoming Serie A games that are due to take place. As you can see, the games range from anywhere between 147 and 248 markets in total. This is really impressive and offers up one of the biggest range of markets that we have seen for these games anywhere online. The coverage continues to other larger European leagues. Just to give some context, the second division of these major leagues (Serie B, Bundesliga 2, La Liga Secunda etc.) offer a similar market coverage to that of the lower leagues in England. Whilst 888Sport probably aren’t best known for offering up a huge array of unusual markets, they do have a few tricks up their sleeve that we noticed. The ‘Player Specials’ section is where you need to head to get the best of them. First off, you are able to bet on a player to gain an assist, which is probably more popular today than it has been, so not a massive one. Other markets include the likes of being able to bet on multiple assists and also if a player hits the post or crossbar in the match. You’re also going to find ‘Other Bets’ for the majority of the more popular games. Here you get a real mix of bets. There aren’t that many to choose from, with the Newcastle v Arsenal game that we’ve spoken about already in this article having just one, but it’s an odd one. Dwight Gayle & Pierre-Emerick Aubameyang to score, Mesut Ozil to give an assist, Jamaal Lascelles, Jonjo Shelvey & Shkodran Mustafi to get a card. The bet is made up like a request a bet style that you see from other bookmakers and 888Sport unfortunately don’t seem to offer. Given that the number of bookies who are keen to offer these bet types is growing, seemingly on a weekly basis, we aren’t sure if this is an ‘unusual’ betting market, but it’s certainly one that we feel noteworthy. Whilst having a betting blog is not all that uncommon these days, having one that offers daily content and engaging articles is. You see, what most bookies do is use their blog to push promotions in sports that most of us aren’t interested in. But, the Tips News and Views blog on 888Sport is a little different. The site is updated daily and whilst it does include sports other than football, it’s definitely got more football content than other sports. What was great is that a mix of writers are on board and with it allow you to read several opinions on each match. The insights seem more than just an agenda to push a promotion or get people to bet and instead include information on why a potential betting market might offer good value. It’s not ground-breaking stuff by any means, but it sure as heck beats the majority of bookmakers betting blogs, that is for sure! 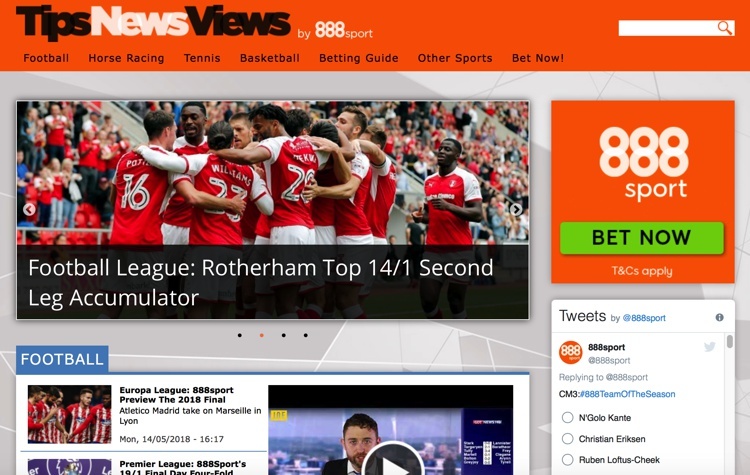 Whilst this isn’t necessarily a betting feature that many might enjoy and not necessarily football focussed, we did feel the need to include a feature that 888Sport offers called Verify Now. If you are new to football betting then it’s likely that you aren’t aware that to withdraw money, you will likely need to send in some form of ID and proof of address. It’s pretty common practice these days, so better to be aware now than later down the line. The Verify Now section means you can upload your document as soon as you like to upgrade your account. This means that when you do need to make a withdrawal, you aren’t then waiting on the verification process that can slow your process down. The cash out functionally has only recently been added to 888Sport, but it’s one that has been welcomed, especially given that pretty much all of their main competitors are now offering this feature. For those that don’t know, cash out is where you can settle a bet before the end of a game. It means you can either limit your losses or lock in a profit before the final whistle. The 888Sport version is pretty basic if truth be told. It’s straightforward in that you can cash out certain football bets at any time. But, the lack of any partial cash out functionality or edit bets, which is a popular inclusion for some bookies, was a little bit disappointing. It’s also worth noting that you can’t use cash out for any other sports other than football. What’s frustrating about 888Sport’s version is that it doesn’t tell you which games are going to use cash out betting and which aren’t. We’ve had bets from the lower leagues that haven’t been available, but we weren’t aware of this prior to placing the bet, which is frustrating. The in-play betting section at 888Sport is pretty good, but it’s not one of the best that we’ve tested. The main thing for us is the interface. It feels very dated and a bit cumbersome to be honest with you. It’s in the form of a long list, which can work well, but when it comes to the likes of a Saturday afternoon with games kicking off from around the world, it makes sorting matches very tough. 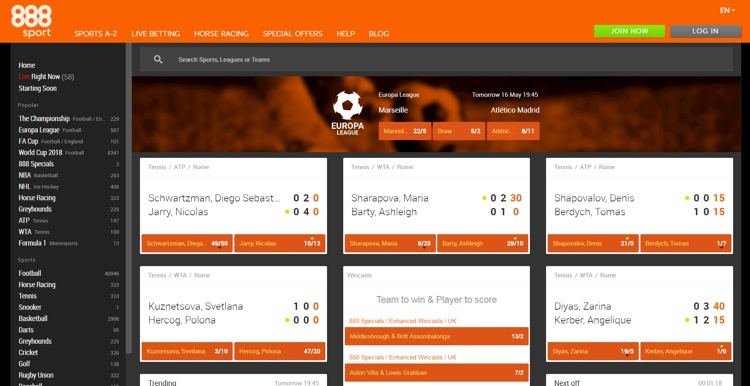 There is no way that we’ve seen where you can sort just by league or even country for live betting, which means the whole page can get very overwhelming. But, the saving grace for the whole section was the ability to favourite games. Once you clicked the little star icon your game would be pinned to the top of the page. So, if you’re betting on an accumulator that you want to track or you just like the look of some games for that others, this is a great feature. Once into an individual game, the functionality greatly improves for us. The number of markets are going to vary depending on the game and the league, but the inclusion go the three-tier system, is one that we like. As you can see, you get a good list of games running down the left with the markets for that specific match in the centre. The fact you can expand and collapse these markets is a great addition in our opinion, allowing you to keep it tidy when needed. The right-hand side column includes the match centre, which allows you to see what’s going on with live updates and areas in which teams are attacking or have possession. You can also see some vital match statistics here as well, such as attacks, dangerous attacks, shots on target and shots off target, along with red/yellow cards and corners at the top. The inclusion of stats is an important feature for betting sites, with most of them offering a version these days to be fair. 888Sport have teamed up with Bet Radar, who work with a number of other online bookmaker as well. The stats are pretty good and offer up a nice overview of the match on offer. What you will find is information on recent form, previous results, player form in the way of goals, standing in the league, head to head data and also history of the two teams. Whilst the info is good, we wouldn’t say it’s amazing and offers you more of an insight as to extensive research in terms of how each team might perform. Still, it is free though, so can’t really complain. As blanket limit across the whole bookmaker, the maximum that you can win from a single bet at 888Sport is that of £250,000. This amount is pretty standard, although we have seen bookies that award up to £1million, so it’s worth bearing this in mind should you think these limits will affect the potential payout for your bet. Remember, the max payout and max bet for each selection is different. If you bet a stake that offers over the maximum payout, your bet will be accepted. If it loses your whole stake will be removed. If it wins, your payout will be capped. All domestic top level leagues for men in the following countries: Denmark, England, France, Germany, Italy, Netherlands, Norway, Scotland, Sweden & Spain. Any main domestic cups from the following countries: Denmark, England, France, Germany, Italy, Netherlands, Norway, Scotland, Sweden & Spain. A £50,000 limit will be applied on all other matches from around the world and domestically. 888Sport actually include a wide range of deposit options to choose from within the bookmaker. In fact, it’s one of the biggest that we have seen. Some of the more unusual methods include Apple Pay, PayPal, Skrill and dozens of different e-wallets, many of which we haven’t heard of. The improvement that 888Sport has seen over the last decade has been massive. They’ve gone from being a bookmaker that many people weren’t that impressed by, us included, to one that has to be recognised as one of the better ones in the business. The design of the site is possibly something that we would call them up on, but this version is already so much better than the last. What makes it for us though is the pricing. We’ve spoken that the pricing is erratic, but this is definitely a good thing. Being able to get the best odds in one of the most competitive industries and the most competitive sports (football) is not an easy feat. 888Sport aren’t always going to be the best at everything they do, but their unpredictability is something that we have really enjoyed. 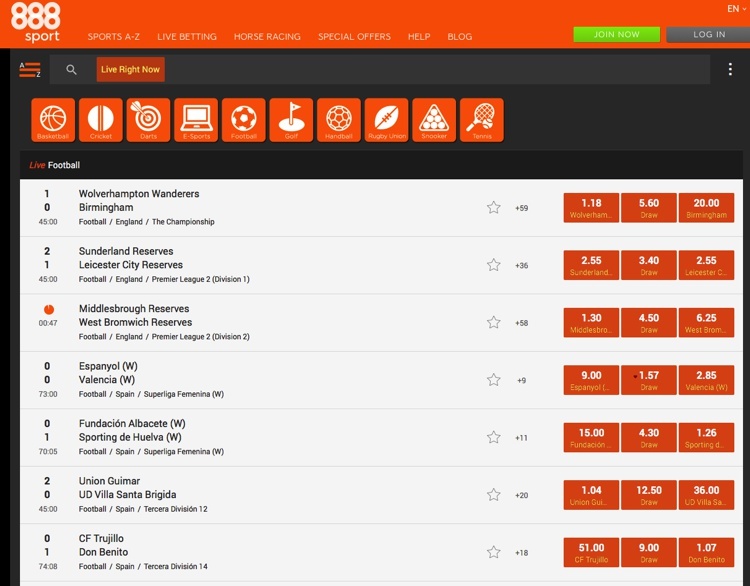 We think that the site works great as part of a betting armoury. A site that isn’t going to be used for every bet, but will be on hand if, or more appropriately, when the time comes.